For the volunteers and the communities visited, this was a unique opportunity to connect over a common interest: a love of reading. LWB has made several visits to the school to work on development projects since their initial visit in 2009. During the latest visit, volunteers offered their expertise to catalogue books, organize a celebratory library day, and facilitate book lending. While lending libraries are uncommon in Guatemala, the Asturias Academy hopes that lending its books to students will help develop a culture of reading. 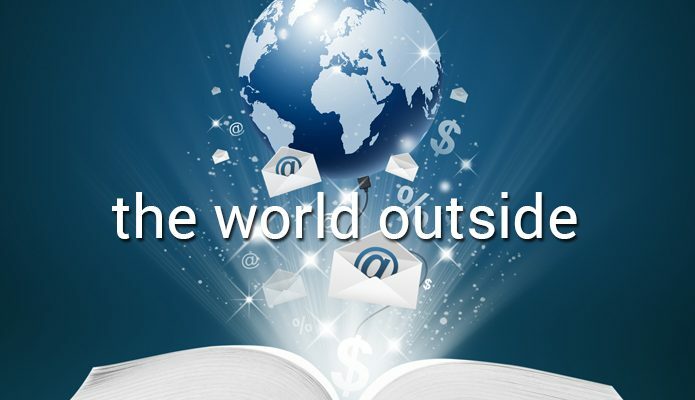 After several years of planning, the Asturias Library was able to pilot book lending to an enthusiastic sixth grade class. LWB volunteers engaged the class with skits and dialogue about the benefits and responsibilities of being able to take books home with them, and all books were returned in good condition the next day. That day also saw all 200 Asturias students visit the library to participate in Library Day, an LWB event designed to get students excited about the library and reading. The younger grades, before making their own puppets, enjoyed a puppet theatre spin-off of The Three Little Pigs that had the pigs building libraries and reading books on tactics for de-escalating wolf violence. Middle grade students alternated between a movement-based trivia challenge and a “comic jam” in which small groups collaborated to create a library-themed comic strip. Higher grades wrote guided poetry about a favorite character from a book and about themselves. The students’ enthusiasm was priceless. After a week in the city and a 6-hour drive on steep, winding roads, the volunteers arrived in the remote town of Chajul. The contrast with urban Quetzaltenango was immediately evident: roads are rough, tourists are few and most locals speak the indigenous Ixil as their first language. LWB’s trip to Chajul was coordinated with Limitless Horizons Ixil (LHI), a non-profit organization focused on community education. The recognition that students did not have access to the information resources needed to complete their homework led LHI to create a community library in 2011. 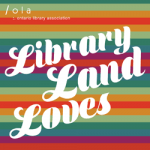 A much needed resource, the library is a vibrant space staffed by enthusiastic local librarians who offer homework help, story time activities and a safe space for children in the community. The librarians working in Chajul are always eager to collaborate with and learn from their peers from other countries, and LWB’s recent visit included a lot of great dialogue about library systems and programming for children and teens. They asked LWB volunteers to deliver story time for their patrons so that they could gather inspiration to inform their future programming. 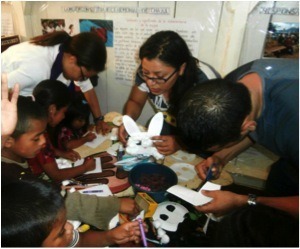 Volunteers planned stories and songs that had a rabbit theme, followed by making rabbit hand puppets and masks. The participating children, most of whom do not have their own crayons or art supplies at home, were thrilled to create and personalize their rabbits, complete with cotton ball and glitter glue accents. 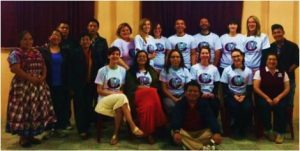 For the LWB volunteers who travelled to Guatemala, the trip was an opportunity to provide service, exchange ideas, and learn about libraries in another part of the world. For student volunteers, the hands-on experience provided insight into possible career paths; professionals gained new perspectives on their own services and patrons. LWB’s support for Guatemalan partner libraries will continue from a distance, at least until the next service trip is planned. Carolyn Doi was the Guatemala Program Manager for Librarians Without Borders from 2011-2014 and has travelled to Guatemala several times to lead library development projects with LIS volunteers. She currently resides in Saskatoon where she is the Music and Education Liaison Library at the University of Saskatchewan Library. She may be contacted at carolyn.doi [at] usask.ca. Sarah Dahlen is a Reference and Instruction Librarian at California State University, Monterey Bay. She is the treasurer of REFORMA, an association that promotes library and information services to Latinos and Spanish-speakers, and has been to Guatemala twice with Librarians Without Borders. She may be contacted at sdahlen [at] csumb.edu.